This topic contains 16 replies, has 1 voice, and was last updated by Dan 2 years, 5 months ago. i just got my dewalt track saw with the 52″ and the 102″ track while checking things out i noticed the theres a slight crown to bought tracks that are consistent is that normal? My Festool tracks and dead on . I know some guys have sent them back until they got a straight one from the lot . Are they straight?…that is what is most important. Will thwy lay flat when you put them on a sheet of ply? Are you storing your tracks against the wall? If you are try hanging them instead of laying them against a wall. I have Bosch/Mafell tracks I found my 1.1m rail has a small amount of bow to it as well and I’ve flipped the side that rests against the wall to see if it’ll bend the other way. I don’t think a bow will matter. Once clamped down it should lay flat. yah there are the track saw clamps that you can use and it’ll straighten right out. I almost never use the clamps to hold the tracks down. It is so rarely necessary. I have a few Makita tracks and they are straight. Did you put a good level of the edge of them? depending on what I am cutting I use clamps it I want to be more precise. If I am just roughing something I do not. they have their purpose. I would say as long as the guide edge is straight a crown should not be an issue. I have never noticed any distortion of my Makita tracks however. Festool clamps will fit Makita tracks and vice versa, I am not sure about Dewalt tracks however. 90% of the cuts I make don’t require clamps. The crown will likely lay down when the saw crosses over that area. My thoughts are in line with Kurt. 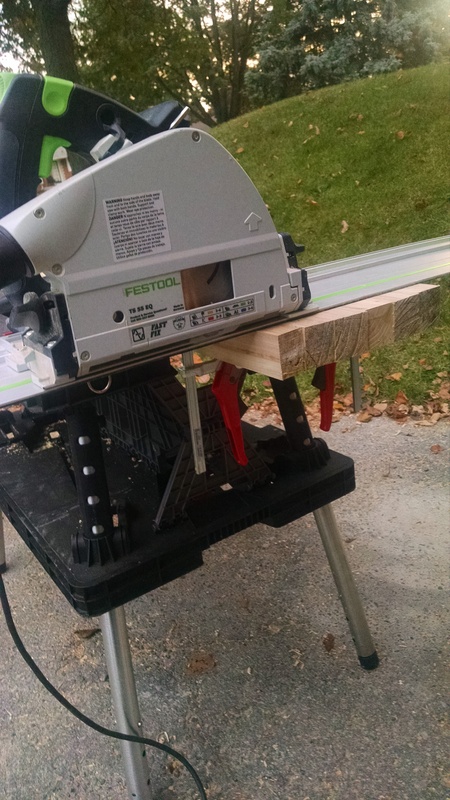 I use the Dewalt clamps on my Festool track. Plenty of plywood is cupped a little anyway so better to clamp them. I dont on decks and not always on doors but thats a bad habit. Sometimes the extra time taken for the clamp is well worth the piece of mind. You gotta figure that a 9′ piece of aluminum will be prone to flex a bit from time to time. As long as you don’t get a twist in it, your fine. yah but sometimes i want it to be precise like the edge of my workbench top so i made sure everything lined up and i didn’t move it around. I have only clamped the track one time. That was when I was making a cut in some siding that was already installed. In that case, gravity mandated that it be clamped. I have several Festool tracks, I haven’t noticed a bend or bow in any of the. I rarely need to clamp mine either.